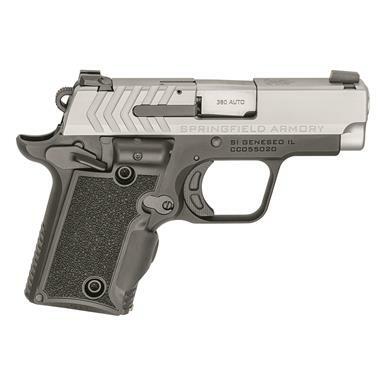 Springfield 911, Semi-Automatic, .380 ACP, 2.7" Barrel, Stainless, VIridian Green Laser, 7+1 Rds. When the police are minutes away and the threat is seconds away…dial up the Springfield® 911. Because sometimes, you have to be your own first responder. Engineered for everyday carry, the 911 .380 is just 5.5" long and 4" tall, and features a snag-free profile that's undetectable under clothing. Springfield’s Octo-GripTM front strap texturing ensures a secure grip and is complimented by a G10 Octo-GripTM textured mainspring housing. G10 Thin-line grips and a short reset, crisp 5-pound trigger come together to give the feel of shooting a full-sized firearm. Designed for life-saving defensive use at close range, the 911 features an ambidextrous safety and is perfectly matched with an Ameriglo® Pro-GloTM green tritium front sight inside a yellow luminescent circle, and a tactical rack rear sight with green tritium inside of white luminescent circles. Approved for the most advanced and modern .380 defensive ammunition, the 911 comes with a flush 6-round and 7-round extended magazine. This model comes with Viridian® Green Grip Laser installed. The Laser activates automatically when you grip the Pistol, delivering rapid target acquisition when it matters most.